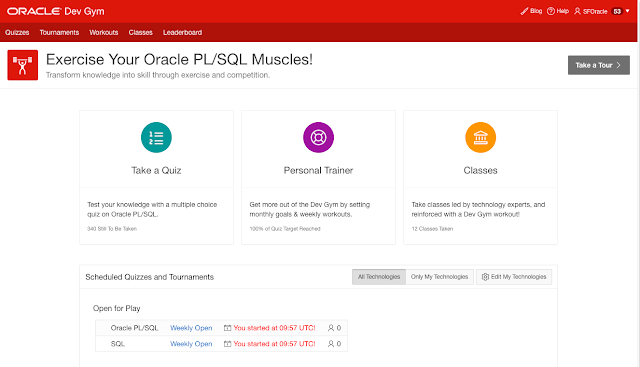 As some of you may know, we've been working on a new "skin" for plsqlchallenge.oracle.com, one that is more modern and responsive, and that makes it easier to quickly take a quiz. The Oracle Dev Gym is still in an "early adaptor" state; you can take quizzes, including our weekly competitive quizzes, there. You can set up workouts and so forth. But we are not yet offering it as a day-by-day alternative to the "traditional" PL/SQL Challenge. 1. The URL devgym.oracle.com is now configured, so you can more easily go directly to the Oracle Dev Gym (instead of going "through" the PL/SQL Challenge. 2. We've come up with a simpler, more immediate design for our home page. 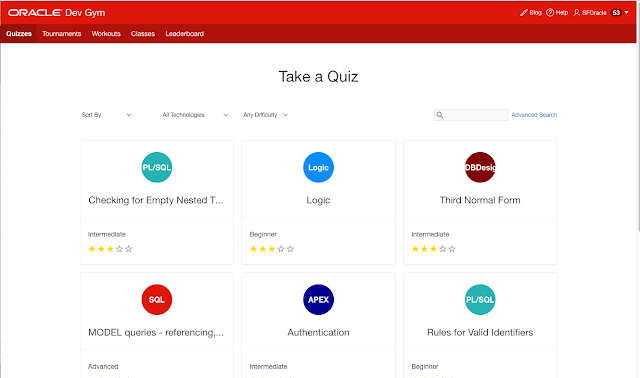 Rather than having to choose "Take a Quiz" from the home page, and then go through another layer of selection from there, the home page now offers immediate access to quizzes. To take a competitive, weekly quiz, click on Tournaments.